Download Common Entrance Exam For Design Previous year Question Papers from the CEED IIT Indian Institute of Technology IIT Bombay Website. 1. The total duration of the examination is 3 hours. The question paper contains two parts – Part A and Part B. The duration of Part A is one hour. The duration of Part B is two hours. Part B will start only after Part A ends. Part A cannot be attempted after Part B commences. 2. Questions of Part A and Part B will appear on the computer. Answers to Part A have to be entered in the computer. Answers to Part B have to be given in the answer booklet provided by the invigilator. 4. For each NAT question, the answer is a real number with decimal digits up to two decimal places. The answer needs to be entered using the virtual keyboard on the monitor. No choices will be shown for these questions. There is no negative or partial marking for NAT questions. 5. Each MSQ has four choices of which one or more is/are the correct answer(s). The marks will be awarded only if all the correct choices are selected. 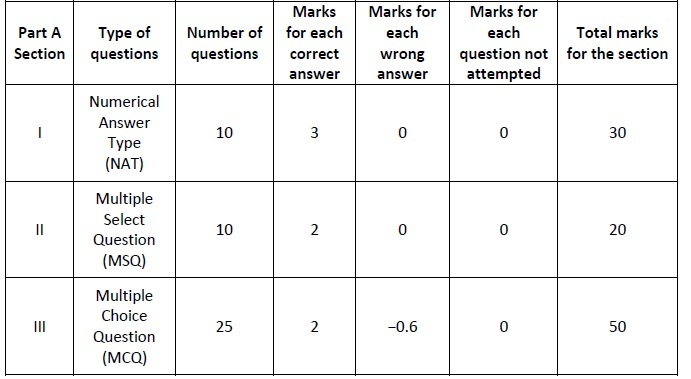 There is no negative or partial marking for MSQs. 6. Each MCQ has four choices of which only one is the correct answer. In MCQs, the correct answer will be awarded 2 marks and wrong answer will be awarded -0.6 marks. Questions not attempted will be awarded zero marks. 7. Scribble pads will be provided for rough work for Part A. These have to be returned to the invigilator at the end of the Part A exam. 8. Part B carries a total of 100 marks. It contains 8 questions. You may choose to answer any ONE of Questions 1, 2, 3, 4 and 5. Questions 6, 7 and 8 are mandatory. Each question must be answered on the page(s) designated for that question in the answer booklet. Additional instructions to Part B questions are provided in the answer booklet. 9. In Part B, colour pencils, crayons, sketch pens etc. may be used unless otherwise specified in the questions. 10.Charts, graph sheets, mathematical tables, calculators, mobile phones, and other electronic gadgets are not allowed in the examination hall. Q.01 All the four-digit numbers except one is written using a single font. Identify the number that does not use the same font as the other numbers. Q.02 Find the number which will replace the question mark. Q.03 An intersection is a point where two or more lines/curves meet or cross. How many intersections are there in the figure given below? Q.04 How much distance (in cm) will the bicycle shown below travel, if the pedal makes 1.5 revolutions? (Assume p = 22/7). Q.05 How many glasses will remain empty if you half-fill some of the empty glasses, from the given set of filled glasses? Q.06 Two perspective views of the same solid object are shown below. How many surfaces does the object contain? Assume hidden surfaces to be flat. Q.07 Two water tanks A and B of equal square base of sides 3 feet are shown below. Water flows from tank A to tank B through a tube. What will be the volume (in cubic feet) of water in Tank A when the water stops flowing? Q.08 A solid is shown in the figure below. The vertices ABCDEFGH form a 4 cm × 2 cm × 2 cm cuboid. The segments AI and DI are both of length 5 cm, and points ICGFB are coplanar. What is the height (in cm) of point I from the base rectangle EFGH? Q.09 The figure shows the front view of a convex lens, which originally had only one edge. Five holes of different shapes, namely triangle, square, pentagon, hexagon and circle, were drilled through it at points P, Q, R, S and T in such a way that the holes were parallel to each other, perpendicular to the edge and all the holes were still within the lens edge. What is the total number of edges in the lens after the holes were drilled? Q.10 In terms of calories, 20 jamuns and 3 bananas combined are equivalent to one mango and one papaya combined, and 2 mangoes and 5 bananas combined are equivalent to 4 papayas and 80jamuns combined. Then 8 papayas and 2 mangoes are equivalent to how many bananas? Q.11 A designer has designed a logo. The form is shown on the left and its accompanying text is shown on the right. Which of the following statements about this logo is/are TRUE? A. If this logo is printed on an envelope with a 60 DPI dot-matrix printer, such that the total height of the logo is 2 cm, then the logo will retain its original form. B. If this logo is printed on a flex sheet with a 720 DPI flex printer such that the total height of the logo is 15 ft, then the logo will retain its original form. C. This logo can be reproduced as shown above by using a four colour screen printing process. D. The visual properties of the English font match the visual properties of the Hindi font. Q.12 Image P shows a portion of a larger photograph. Some operations have been done on that photograph using an image manipulation software. Image Q shows a portion of the resulting photograph. Identify the option(s) that specifies/specify the correct operations. Q.13 If you are asked to draw the following four figures with the following constraints: They must be drawn in a single stroke (without lifting the pen from paper), and each line is drawn only once. Which of the options can be drawn? Q.14 The pie chart shows proportions of income tax paid by a population of eight individuals. Each individual’s tax share is shown in a different slice of the pie. Which of the statements can be derived from the chart shown below? A. About half the total tax is paid by less than half of the population. B. About half the total tax is paid by more than half of the population. C. About three-fourth of the tax is paid by three-fourth of the population. D. Some individuals paid more than double the taxes as compared to some others. Q.15 Four square table-tops of the same dimensions are shown below. Only the designs of their supports are different from each other. If a person stands upright on the red mark on each of the table, which of the tables will topple? Q.16 A glass cube with 27 equal compartments is filled with water. There are a few red balls floating inside the compartments. Three views of the cube are shown below. Identify the red ball(s) that is/are represented incorrectly in the top view. Q.17 Which of the options is/are simple rotations of the figure given below? Q.18 Which of the following drawings illustrate(s) the use of the animation principle of “Squash and Stretch”? Q.19 Monitors with different resolutions can be attached to a computer. The computer can also render a video at various resolutions. Assuming that the videos are played at 1:1 resolution, which of the following options is/are TRUE? A. Given a video, a monitor with a higher resolution will display it in a smaller size than a monitor with lower resolution. B. Given a video, a monitor with a higher resolution will display it in a bigger size than a monitor with lower resolution. C. Given a monitor, a video with higher resolution will be visible in a smaller size than a video with a lower resolution. D. Given a monitor, a video with higher resolution will be visible in a bigger size than a video with a lower resolution. Q.20 If all the lines in the image below are of the same length but of different thickness and are drawn in perspective with respect to their distance from the viewer, which of the following statements will be TRUE? Q.21 Identify the correct font used for Parle-G biscuits. Q.22 Identify the option that will replace the question mark. Q.23 Identify the option that will replace the question mark. Q.24 Shahid is feeling very sleepy. He yawns and stretches. Identify the correct image. Q.25 Which is the correct representation of the posture of a house lizard as it climbs a wall? Q.26 Which of the given configurations of Palki (Pallanquin) will work the best for the traveller as well as for the labourers carrying the traveller? Q.28 From a 3-dimensional structure made of cubes, eight rows of cubes have been removed as shown below. Select the correct pattern that will emerge from the side shown with an arrow. Q.30 A square paper is folded and cut as shown below. The paper is then used as a template to spray-paint a white wall with black paint. Which pattern would be created using this template? Q.31 In a camera, the opening through which light enters the camera is called aperture. The distance between the closest and the farthest part of a view captured on a photograph, which is in focus, is called depth of field. Given that all other settings remain the same, which of the following is TRUE? Q.32 Identify the option that will replace the question mark. Q.33 A cat is sitting on a wall on the left side of a house. Identify the correct option that shows the cat’s point of view as it looks at the house? Q.34 Identify the option that will replace the question mark. Q.35 Images of traditional products of certain states of India are shown below. Identify the correct set of states to which these belong. Names of the states are in a random sequence. The products are made out of clay, willow/wicker, wood and brass. Q.36 Refer to the following image of a wooden artefact made using traditional manual tools, skills and processes. Identify the correct set of operations required to make it. The operations in the options are in a random order. Q.37 Refer to the chairs shown below. Which of the following statements is TRUE? Q.38 How many right-angled triangles are there in the given image? Q.39 A solid created by rotating a planar-shape about an axis is called a “Surface of Revolution”. The figure below shows a shape and the axis of revolution which is used to create such a solid. Which of the options would be the correct top view of this solid? Q.40 Identify the option that will replace the question mark. Q.41 A 3D illusion painting is created on a road. Shown on the left is how it appears to a viewer in perspective. If this illusion has to be sketched on paper, before it is painted, which one of the options on the right would be correct? Q.42 Fill in the blanks to keep the sentence grammatically correct as well as meaningful. ……….. the facts, she proceeded with her decision, finally ending up with a …………. situation. Q.44 A micro-interaction has been designed for a ‘menu’ icon. On clicking this icon, it changes into a different icon representing ‘back’, depicted by an arrow. On another click it changes back to the menu icon. Shown below are 13 key-frames of this animation. Their order is incorrect, but the ones in green are in the correct position. Identify the correct order of this animation. Q.45 Imagine a possibility of an emergency evacuation scenario in a domestic household in India. The height at which the inside latch of the exit-door should be installed is to be finalised. It is required to disallow opening of the door accidentally by children. Which option will determine the height at which the latch should be fixed? Assume the height of the tallest child is lower than that of the shortest adult. A. The height of the tallest adult in the family. B. The height of the shortest adult in the family. C. The average height of the child in the family. D. The average height of the tallest adult male and tallest adult female. During the monsoon season, drying of washed clothes at home takes a long time. The interior of the house is usually very damp. It is observed that people tend to spread the wet clothes on a chair or other furniture below a ceiling fan, to dry them. Such temporary arrangements help them cope with the problem. a) The product uses a fan for drying clothes. b) The fan must be integrated with the product during its use in rainy season and must be usable as a “normal fan” during other seasons. c) The product should be foldable and compact for storage. Design the product as per the objectives listed above. 1. Present three ideas of design alternatives through rough sketches. (10 marks) Evaluation Criteria: Quality of creative ideas and neatness of sketches. 2. List ten critical factors (key words only) you will consider for designing. (10 marks) Evaluation Criteria: Understanding of the situation and product use. 3. Select one of your ideas and develop it into a final product. Make a neat sketch of the same. Indicate all the parts, material and features on this sketch. (20 marks) Evaluation Criteria: Sketching quality, details, product features and usability issues.